If you're searching for St. Louis lawn care and landscaping careers you've come to the right place! Dowco is always looking for outdoor living professionals! Our Chesterfield, MO landscape maintenance company has openings available for you to advance your career by learning new green-industry skills as well as how to lead a team and manage your crew. We are a vibrant and growing St. Louis based Landscape Maintenance Company looking for the best talent available. Our nationally recognized company provides qualified individuals with a dynamic opportunity to contribute to a great team! Many positions are a stepping stone to management positions and a catalyst for future career growth. Problem Solving Skills – you can find solutions to anything. You’ve shown that you have the ability to make quick decisions based in reason. Dependability – If you make a promise, then you keep it. We can rely on you to be at work, in uniform and on time every day. Love for Money & Achievement – you’re determined to make more money by working hard, achieving goals, and getting outside your comfort zone. Loyalty – you’re not one to jump around from job to job. You have long term relationships in your personal and professional life. A Commitment to Safety – we rely on you to be able to safely get to work and drive your teammates around so a valid driver’s license is a must. You’ll also need to pass a pre-employment drug screen so we can keep the professional integrity our client’s desire. Crew Members start at $13.20/hr. Licensed Special Techs start at $16/hr. Your pay will be determined and increased with your proven knowledge, skills and ability. We will provide you with an environment that is fast paced where you're able to continue your growth. For all of our St. Louis lawn and landscaping careers, we focus on training for both the skills of your job and leadership training. You will be surrounded by people who love what they do and know how to do it. We offer outstanding working conditions for every St. Louis landscaping career that we have. You’ll have safe, clean, and convenient surroundings. Best of all, you work in a fun, drug-free environment with the highest quality vehicles and equipment! Our eagerness to grow is your potential for advancement. There are always new opportunities opening up here. Get on board now so you don't miss your chance to grow with us. Dowco is an equal opportunity employer. Basic computer and iPhone knowledge. Responsive to email and proactive with phone calls. You’ll receive weekly skill development training with the entire team. We also have morning stretch meetings to keep everyone on the same page and recognize the people who have gone above and beyond. 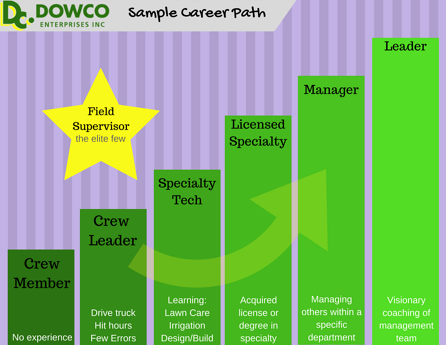 As a Dowco employee you’re eligible to participate in Dowco Academy for free to improve your personal development. Our monthly workshop topics include: financial budgeting, motivation, emotional intelligence, goal setting, buying a home/car, and more! Personalized coaching sessions with your manager will help you become stronger in the work that you do on a regular basis so that you can move up the career ladder and make more money. Apply online today - you won't regret it!